This Item Requires Shipping Via United Parcel Service (UPS). 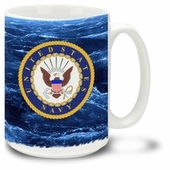 Our U.S. Navy Coffee Mug is a jumbo sized, 16 ounce ceramic mug with UV safe full color printing that wraps around the entire mug. Mugs are dishwasher and microwave safe. Made is USA. This mug would be a great gift idea and a wonderful addition to your military mug collection.